The Park will be meeting on the second Thursday of the month at 6:00. at the Ross Township Municipal Building. **** Wanted**** The Ross Township Park Committee is looking for new members to join their committee. If you use the park to walk or if your child/children use the playground, you might want to get involved. If you can not, maybe you know of someone who might be interested. Please call the township 570-992-4990. The mission of the Ross Township Park & Recreation Committee is to provide a variety of leisure activities that will develop and satisfy your recreational needs. This mission includes forming positive, strong and lasting relationships with those organizations that share this idea. We are currently looking for interested people to serve on our Park & Recreation Board….. It has come to our attention that many people who walk their dogs are using the supplied doggie bags, but leaving them for others to pick up. You need to take your used doggie bag with you. From time to time someone puts a bucket for the used bags, but again you should not expect other people to have to pick up after your dog. Please be responsible and take you bag with you. The Ross Township Park and Recreation Committee continues to work on the park. 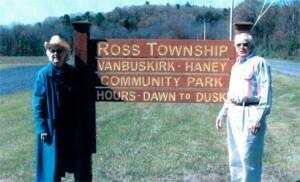 A sign has been erected which reads ” Ross Township Van Buskirk-Haney Community Park”. It was made by one of our residents who donated his time and supplies. There is a one mile walking trail with benches for you to rest and enjoy nature, plus a pavilion with picnic tables that can also be used. a parking lot and playground equipment has been installed for you little ones to enjoy. The park rules are listed further down. Ross Township is in the process of developing a park for the residents of their community. The park is located on the property adjacent to the Municipal building. The land was purchased by the township from Jim and Jean Haney. The name of the park is VanBuskirk-Haney Park at Ross. Some projects have been accomplished by Boy Scouts as their Eagle Scout projects which includes tables and benches constructed and placed near the playground and at the pavilion near the pond area at the lower end of the park. We now have a place where the residents can gather, meet others, hold community events, and enjoy the beauty that our area has to offer. The Veterans Memorial is currently being constructed. Keep checking back for updates and when the dedication will take place. Community Park Plans-a new park plan is being updated and will be posted soon. West End Regional Park Plans-see our link to West End Park & Open Space Commission”s website.